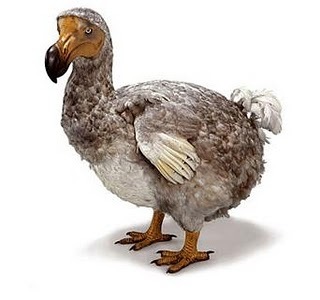 As the Euro goes the way of the dodo, where does that leave the Dollar? The Eurozone is heading for a crash — anyone saying otherwise is either stoned, works in Brussels, or hasn’t checked the European bond market action lately: All hell is breaking loose there. And if, as I have argued here, the Irish Parliament decides not to pass the austerity budget next December 7—that is, decides not to take the European Central Bank bailout—then hell is going to break out in Europe just in time for Christmas: Satan and Santa Claus just might be squaring off on the Rue Belliard before year’s end. Therefore, the smart money starts thinking about what’s going to happen after the euro-crisis-climax happens. In other words, what’s going to happen to the dollar, once the euro goes the way of the dodo. First, we have to understand how we got here, in order to figure out what’s going to happen next. In the 1970’s and ‘80’s, various Latin American republics foolishly pegged their currency to the U.S. dollar. It worked like a charm—at first. At first, all these small-fry countries took advantage of the fixed currency exchange rate to get indebted in dollars, and go off on a big-time shopping spree. It all ended in tears, of course, when the bill came due. Chile, Argentina, Perú, Uruguay, at various times they all had their currency pegged to the dollar. And in each of those situations, once the currency peg became unsustainable, their economies crashed. This is exactly what the smaller economies of Europe did. As I argued back in April, if you look at the euro as simply a very complex currency peg, then the solvency crisis we are witnessing in Europe was inevitable. Just like the banana republics in Latin America, the PIIGS of Europe got over-indebted to the point of insolvency. When the Latin American economies and their bondholders realized—the hard way—that their dollar-peg was unsustainable, the countries devalued their local currency, and started rebuilding their economies. The bondholders? That is, the people fool enough to lend to these countries which had pegged their currency to the dollar? If they were lucky, they took a haircut. If they weren’t so lucky, they went home with a big fat bagel—a big fat zero. What has the ECB been doing, with regards to the failing eurozone economies of Greece and Ireland? They’ve been trying to prop them up with bailouts—but keeping those economies pegged to the Euro. France: Can you hear us now? The French are crazy and need to blow off steam once in a while. Until recently we have been somewhat alone in trying to explain the reality of what was taking place in Europe. In a series of articles, we predicted that Europe would blow up sooner or later, because Europe was basically a tribal environment and, in fact, a patchwork of tribes. In one of our recent articles, we even provided a Wikipedia excerpt showing how the tribes had conquered Rome and then migrated throughout Europe in the next 500 years. To think that Europeans themselves are not quite conscious of their background, or have no tribal solidarity, was naïve in our view. The tribes are bloody-minded. In fact, Europe has been a cauldron of blood and resentments, much of it whipped up by the Anglo-American power elite for purposes of consolidating wealth and power. But the tribal solidarity and brutal arithmetic used by the tribes to calculate their well-being had not in our view changed much in eons. We felt fairly certain the tribes of Europe would take action once they perceived that the EU was not going to prove a net benefit but would actually have a negative impact on their wealth and property. We recalled the unrest of the 1960s (in which admittedly American intelligence played a part via Operation Gladio) and we predicted that those days would come again. The EU, in fact, was not providing any other options, or making it any easier to avoid what has now occurred. Either the elite is out of ideas or out of options. We believe it may be the latter (assuming the powers-that-be are not engineering some sort of total implosion for nefarious reasons yet to be fully comprehended.) By insisting that the common man in various PIGS nations pay back large commercial banks that had lent recklessly to those same countries and enriched their political and industrial elites, EU leaders were almost inviting (and arrogantly so) what has now occurred. The so-called “austerity” unrest was about this perception. Normal people saw that the EU had bribed national elites to build a consensus for joining – and they didn’t wish to pay the bill. It’s not just government pensions. Taxes are going up even as services are going down. Distorted private industrial sectors, gorged on the inflationary euro, imploded over the past few years and shed jobs. Harried people have sought shelter in government work, and now the government jobs are leaving as well. Many economies lie in ruins, and still there are no jobs to be had. Meanwhile, Brussels’ Eurocrats pretend it is the “people’s” fault. Sure governments had been greedy, but ultimately the blame lies with the electorate. So it is said. We are shocked that Ireland has not improved. But we know it will! The EU is still, for instance, trying to bring Iceland into the fold. And numerous other countries as well. There is debate about offering Turkey and even Russia the ability to join the EU. The EU is expansive because the elite likely had the idea that it could create three or four regional, global building blocks that could serve as a platform for some sort of one-world governance. We don’t need any secret plans or startling admissions from insiders to tell us this. We have eyes and ears (2,000 of them!). The EU, the now-scuttled North American Union (for the moment anyway) and the planned regional enterprises in Asia, Africa and South America tell us what we need to know. This was the plan. Of course there are many, especially in the alternative news community, who will maintain that all is working just fine. That the idea all along was to introduce the EU, build it up and then destabilize it. We find this a stretch. We think the elite basically miscalculated. As the Sino-American showdown in the South China and Yellow Seas escalates into the gravest superpower clash since the Cold War, the United States cannot wisely rely on China to help fund its budget deficit for any longer. THE CACOPHONY OF VOICES IN BEIJING QUESTIONING OR MOCKING the credit-worthiness of the US is now deafening, from premier Wen Jiabao on down. The results are in any case manifest: US Treasury data show that China has cut its holdings of Treasury debt by roughly $100bn (£65bn) over the past year to $844bn. ZeroHedge reports that net purchases by the big three of China, Japan, and the UK (Mid-East petro-dollars) have been sliding for two years. In August they bought the least amount of US debt this year. China is finding other ways to recycle its trade surplus and hold down its currency, buying record amounts of Japanese, Korean, Thai, and no doubt Latin American bonds. “Diversification should be the basic principle,” said Yu Yongding, an ex-adviser to the Chinese central bank. Beijing is buying gold on the dips, or doing so quietly through purchases of scrap ores, or by deals with miners such as Coeur d’Alene in Alaska. It is building strategic reserves of oil and coal, and probably industrial metals. State entities are buying up natural gas reserves in Africa and Central Asia, or oil sands in Canada, or timber in Guyana. Where this expansion runs into political barriers, they are funding projects – such as a $10bn loan to Petrobras for the deepwater oil off Brazil. Where all else fails, they are buying equities. All of this recyles China’s reserve surplus away from US debt. So it is a good thing that US citizens have stepped into the breach, investing a record $185bn into bonds funds this year (ICI data). JP Morgan describes this as “extraordinary prejudice”, evidence of irrational fear. Or perhaps JP Morgan has an extraordinary prejudice against bonds, arguably the shrewdest asset in a world where fiscal stimulus is being withdrawn before the rest of the economy has reached “escape velocity”. The inventory cycle is ebbing, manufacturing has tipped over, the workforce is still shrinking, and the economy is sliding into a deflationary rut. Above all, bond appetite reflects what David Rosenberg at Gluskin Sheff calls the new frugality. Americans are saving again. Surplus nations are in for a nasty shock if they hope to feed off US demand as if nothing had changed. Yet bond yields have fallen to nose-bleed levels. Ten-year rates are at an all-time low of 2.27 in Germany, and back to 0.92pc in Japan’s deflation laboratory. They have slid to 2.6pc in the US. When yields plumbed these depths over the winter of 2008-2009, latecomers burned their fingers badly. 10-year Treasury yields doubled in five months as the effects of zero Fed rates, quantitative easing, and $2 trillion of fiscal stimulus worldwide halted the downward spiral. WE ARE ENTERING THE AGE OF RAGE. It is presently most visible in Europe as austerity programs that potentially could shred a half century of social entitlement advances are met with increasingly violent street demonstrations. It is seen in the US Tea Party rallies with their fury that the very fabric which the US capitalist system is based on is being destroyed and discarded. Unfortunately these demonstrations of rage are focusing on the effects and not the cause. The cause is a systemic plaque of unenforced financial control fraud. Americans witnessed CEOs arrested during the nightly news coverage of the S&L Crisis of the early 90’s. They were placated as they heard the details of over 1000 indictments of the perpetrators of fraud. In the aftermath of the tech bubble implosion ten years later, injured investors once again witnessed the most senior executives at Enron, WorldCom, Tyco, Qwest and others being led off in handcuffs and disgrace to waiting police cruisers. Retirees with decimated retirement plans felt that some level of restitution had been made when 25 year sentences were meted out to these formerly high-flying felons. After nearly two years since the greatest financial malfeasants in history and ten years since the last public example of financial crime, the public haven’t seen a single CEO sentenced to hard time for the financial meltdown. They have not had their thirst for revenge quenched by a single high level court case. Instead, the public infuriatingly witnesses politically crafted theater in congressional hearings that go nowhere, read watered down legislation that is replete with even richer lobbyist-authored loopholes and only occasionally see small headlines of quiet settlements with insulting token amends payments. Why? Were there no crimes committed? No laws broken? The public is forced to accept excuses that we have enforcement agencies not enforcing, regulators not regulating and legislators not equipped to legislate properly in our modern fast moving financial world. The public is left with the gnawing concern of whether it is incompetence or something much deeper, more troubling, and more sinister. Confidence and trust in government and our democratically elected politicians continue to worsen from already pathetic levels.